I’ve said over and over again that this story is big, and in Starbase Human, you should start to get a sense as to just how big. You can now buy the ebooks on all sites, the audiobook, and the trade paper. If you can’t find the paper book in your favorite bookstore, ask them to order it. 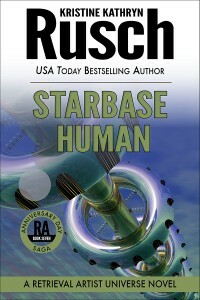 Because as of today, Starbase Human should be available everywhere books are sold. I love the phrases “deeply satisfying” and “very strong payoff.” That’s what I was going for. You can preorder Masterminds on Amazon, Kobo, and iBooks. You can also preorder the audiobook from Audible. The trade paper edition and the other ebook editions will be available on June 9, 2015.